Well, I’m twentysixyearsoldandI’mfinewithit. Despite some jackass who, last night, told me I should start worrying about my wrinkles. If you’re as furious about that as I am, let me know so that I can form some kind of riotous pack and we can hunt him down and do some damage. ANYWAY. 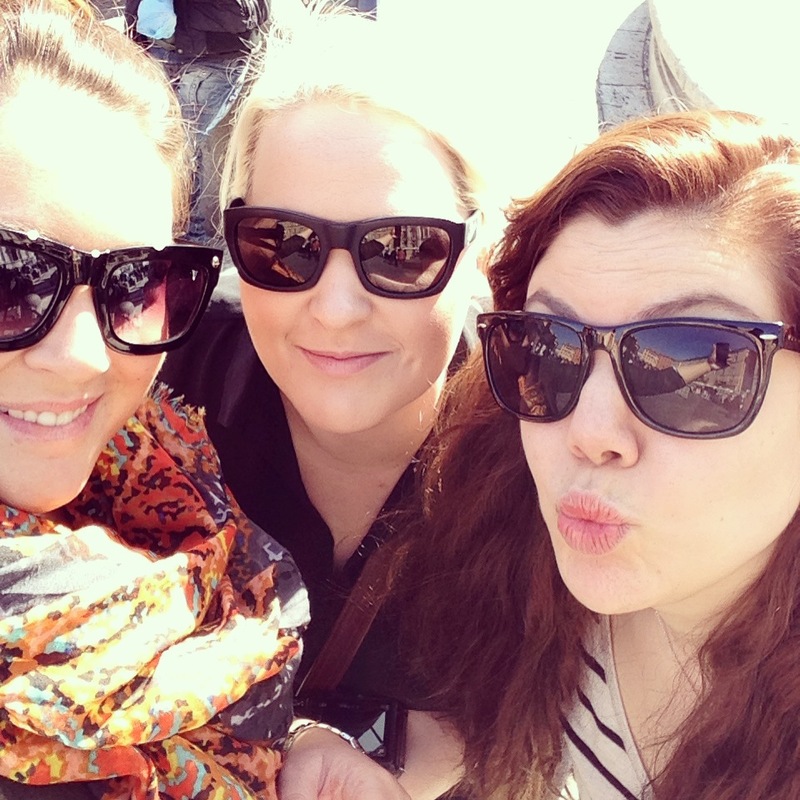 I celebrated my birth (which aside from being FOREVER ago, is probably the most important day of the year for many of us out there) by visiting the eternal city, Rome, with two very lovely friends Colleen and Rachel. We flew Ryan Air, which is the cheapest airline in the universe and likes to prove it by only providing the bare necessities of air travel (so basically some wings and a seat if you’re lucky). Lucky for me, I was in a window seat overlooking the city as we landed. 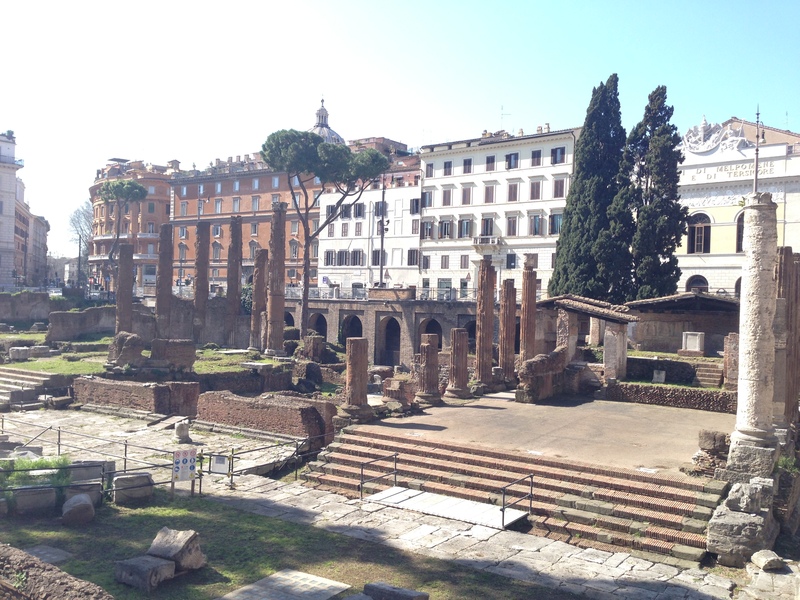 I observed that Rome is tiny- perhaps I’m spoiled by London, but ultimately I’ll admit that I rather enjoyed Rome’s smaller scale. And my feet enjoyed it too as all we did over the weekend was walk walk walk. We checked into our hotel, Panama Garden. It was on the outskirts of the city which was good because it was so quiet and quaint. It was pretty 80s, to be honest with you- which is FITTING because I was born in the 80s. So… I mean we were going for authenticity. The elevator, however, was from the 1930s, I promise you. It was one of those efforts where you open 3 or 4 doors before you can get in there and push some buttons. Rachel and Colleen took the stairs as often as they could but I was quite happy to wait the 7 minutes it took for the elevator to wake up and realise I needed to go places. What can I say, I’m a patient soul. After offloading our luggage- which sounds grander that it was because I cannot emphasise enough how much of a light packer I am, we headed out to find a restaurant for much anticipated Italian food. My Mojito (virgin, of course) was not italian, but I am documenting it in history here as the only time I will pay SEVEN EUROS for a very small drink. It was good, but it wasn’t that good. 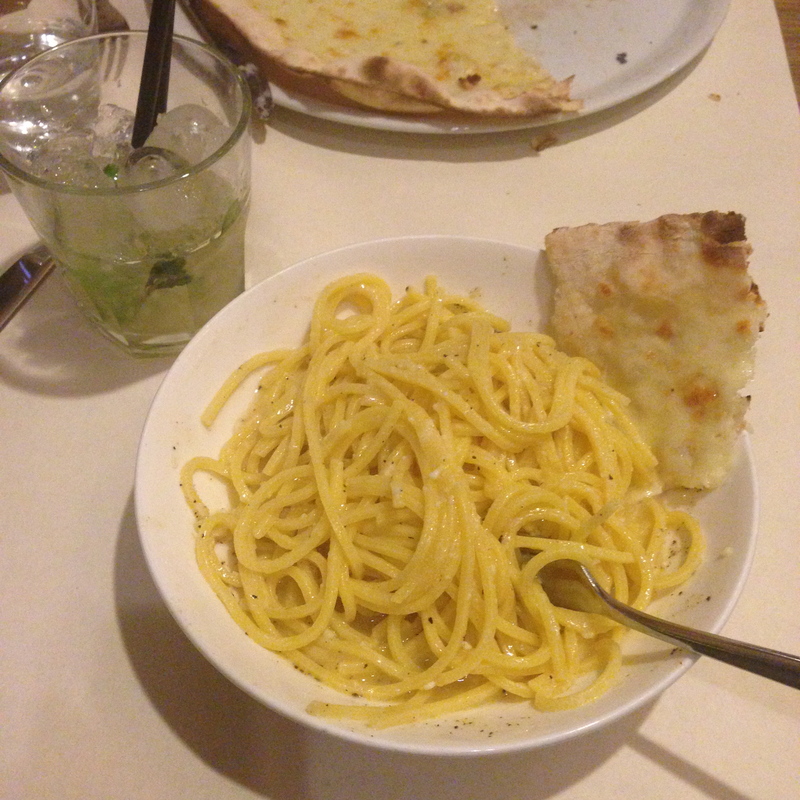 It actually cost more than my actual meal- which was the most incredible fresh pasta and Parmesan in a buttery olive oil sauce with black pepper. 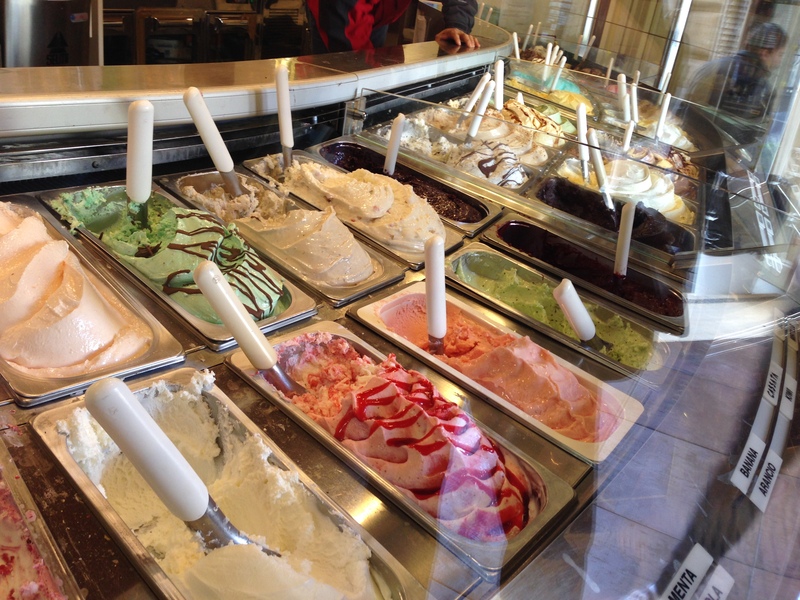 I feel like I should lie to you about the amount of gelato we didn’t consume over the course of the weekend. But I’ll opt to be truthful. We had no less than 8 helpings of this delicious treat from various establishments. Gelato shops are everywhere you turn in Italy, and I for one am not opposed to it. 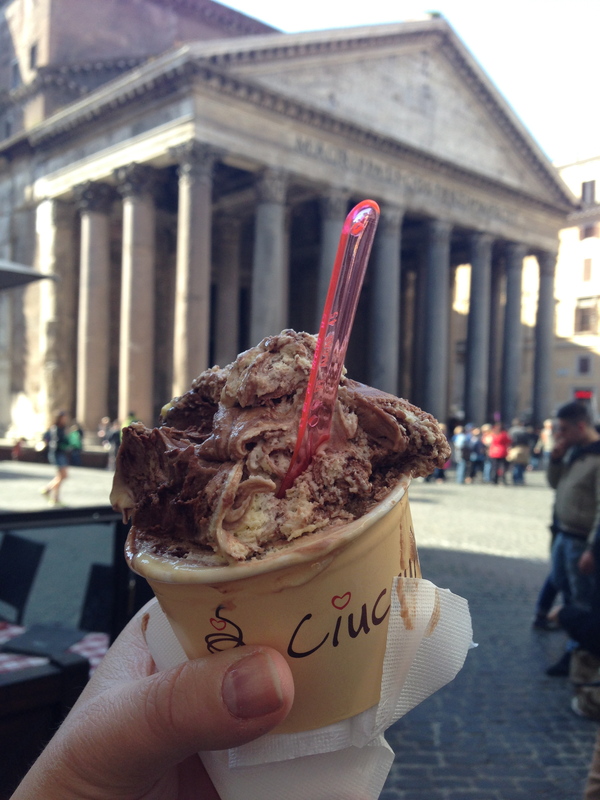 My favourite helping was a profiterole flavoured scoop and a half from a little shop outside the Pantheon. 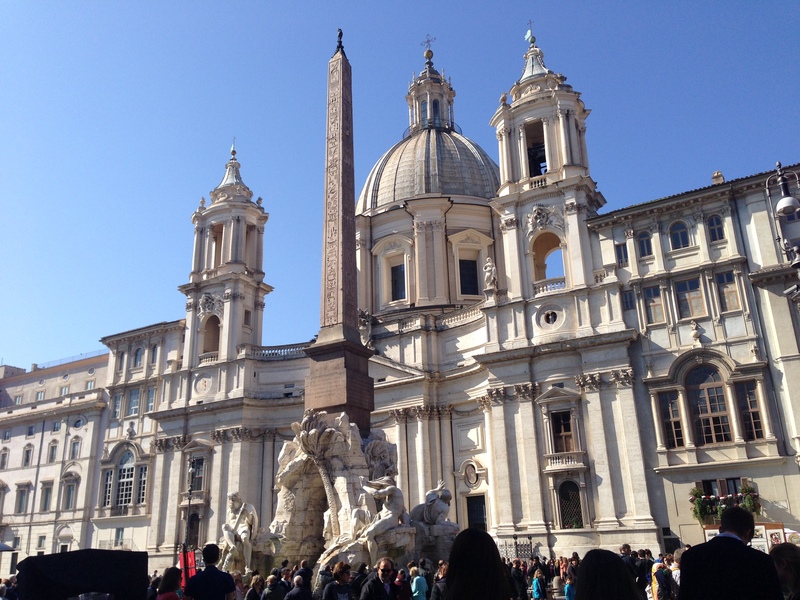 I promise I’ll eventually get to Rome and the tourist sites. But for now I feel like we should all bask in how delicious this gelato looks. Colleen and I have been craving it since we got back (Rachel’s sick of the thought of it by now), but we can’t bring ourselves to pay 6GBP for a scoop at Covent Garden. It’s the principle of the thing. 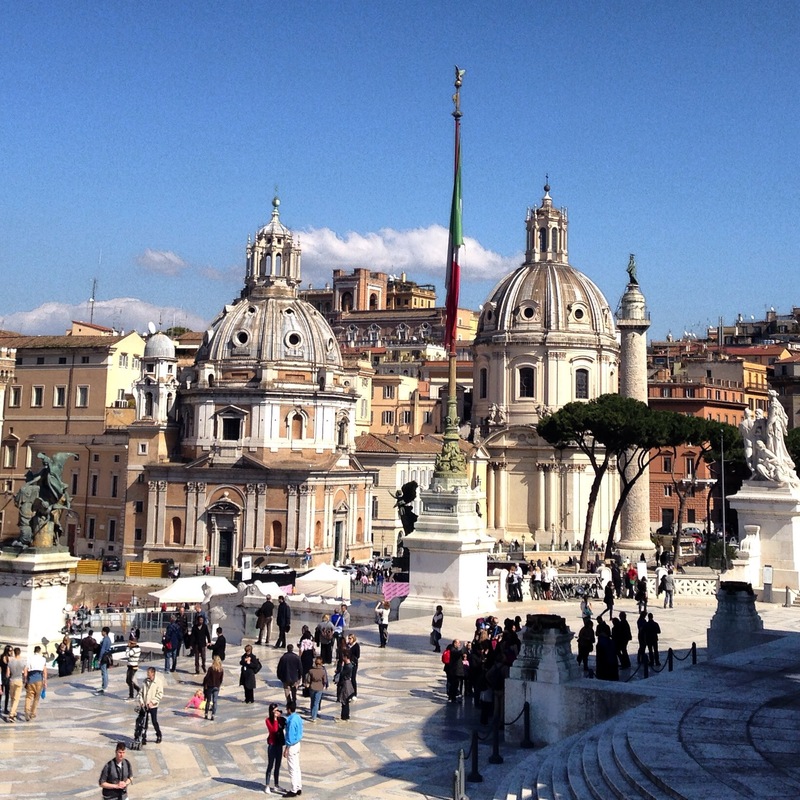 So I guess we’ll just drool over pictures until we make it back to Italy some day. I would like to stress that in my old age I cannot be the slightest bit bothered to edit any of my meager iPhone photographs, so deal with it. 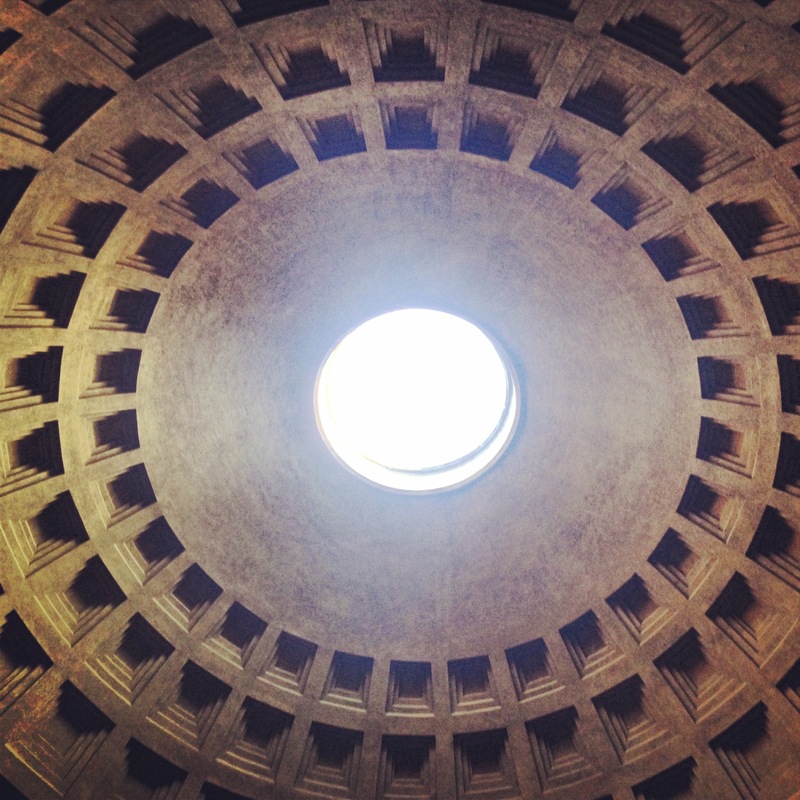 The most impressive thing about the Pantheon (which I always want to call the Parthenon, which is in a different country altogether) is the ceiling. 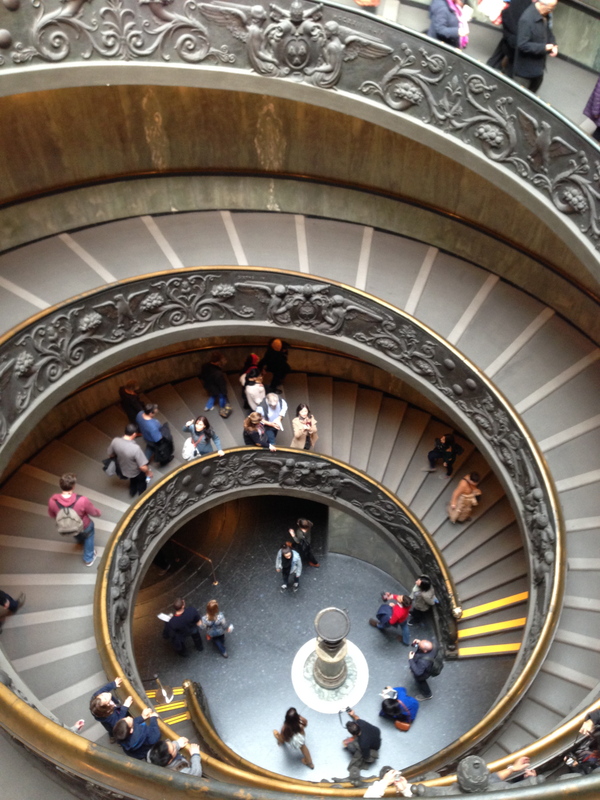 It’s maybe the least intricate thing in Rome, but it’s the thing I’d want to spend the most time looking at. It’s the first time in history that a perfect circle was made, and how they did it- I know not. There’s an open-air hole in the top which is never covered, even in the worst weather. The floors have a very sophisticated drainage system that has not been changed since it was created way back when. My only problem with the hole is that it seems like a weak spot in terms of security. 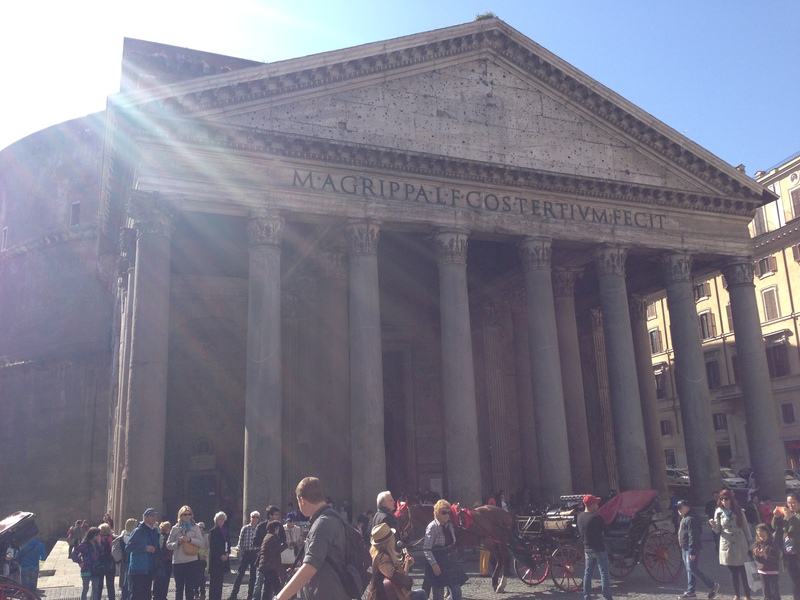 There are some pretty expensive artifacts just hanging out in the Pantheon, and if I were an art robber the first thing I would do is buy myself some absailing equipment and have at it. … and I love it. Roman’s aren’t afraid to let their paint job get chipped and faded by the way. They just whack a few more plants on their balconies and life is good again. I’m now realising that that picture didn’t demonstrate my plant theory, so you’ll just have to picture it. This is just a regular run-of-the-mill church. It’s missing its saints on either side of the building up there- again, don’t expect me to know how or why, I just liked the look of the whole thing. Oh here we are, the travelers. We have been called the “Unholy Trinity,” which I think is neither true nor fair, but we have decided to embrace it and let the chips fall where they may. 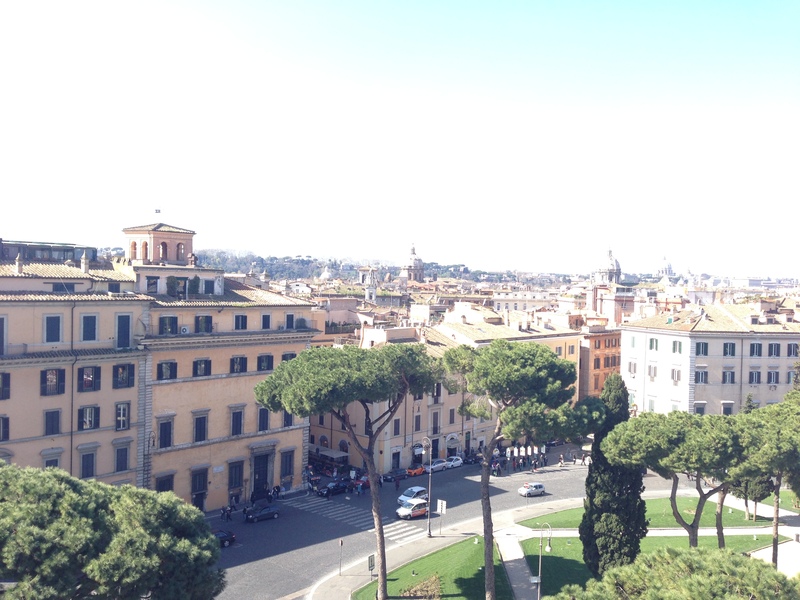 Here’s an over-exposed picture of Rome from the top of steps that went on forever. Rachel ran up the steps like Rocky Balboa- what a show off. I was leisurely and graceful about my climb. I have to take it easy now that I’m a hundred years old. I’m glad that this picture is exposed because it should give you some idea of how sunny and hot it was. Also- the zebra crossing you can see right there? It took us about 9 minutes to cross it because I DO NOT UNDERSTAND HOW TRAFFIC WORKS IN THIS COUNTRY. 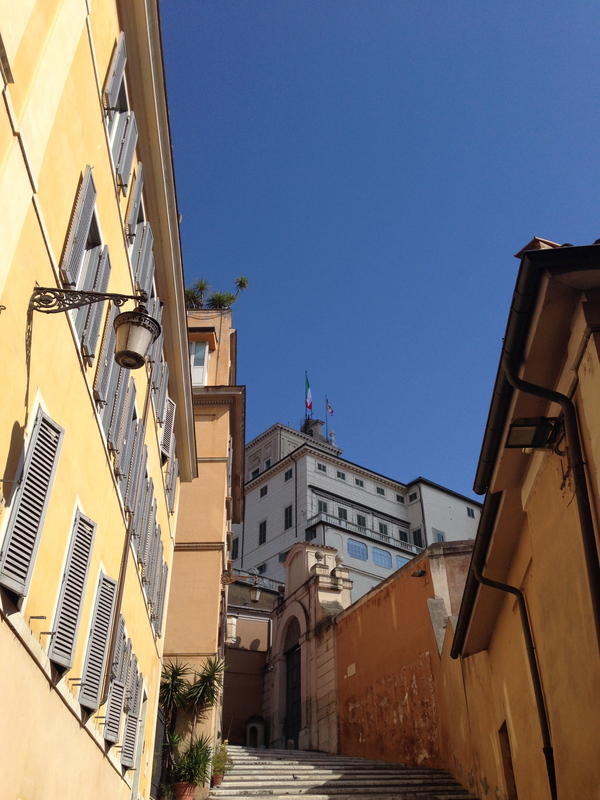 This is just the typical thing you’ll see at every Italian turn. Sort of wish there had been a breeze so that you could see the flag there, but it was no use. The weather was just too perfect. What are you gonna do? 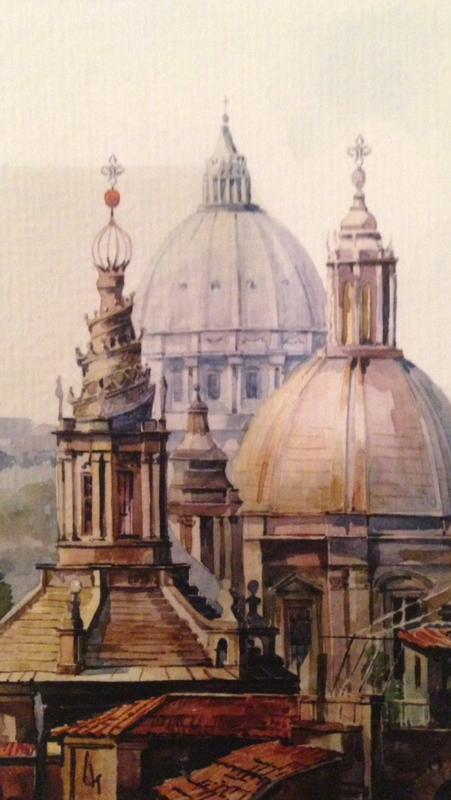 Anyway observe the marble, the statues, the domes, the colours, etc. 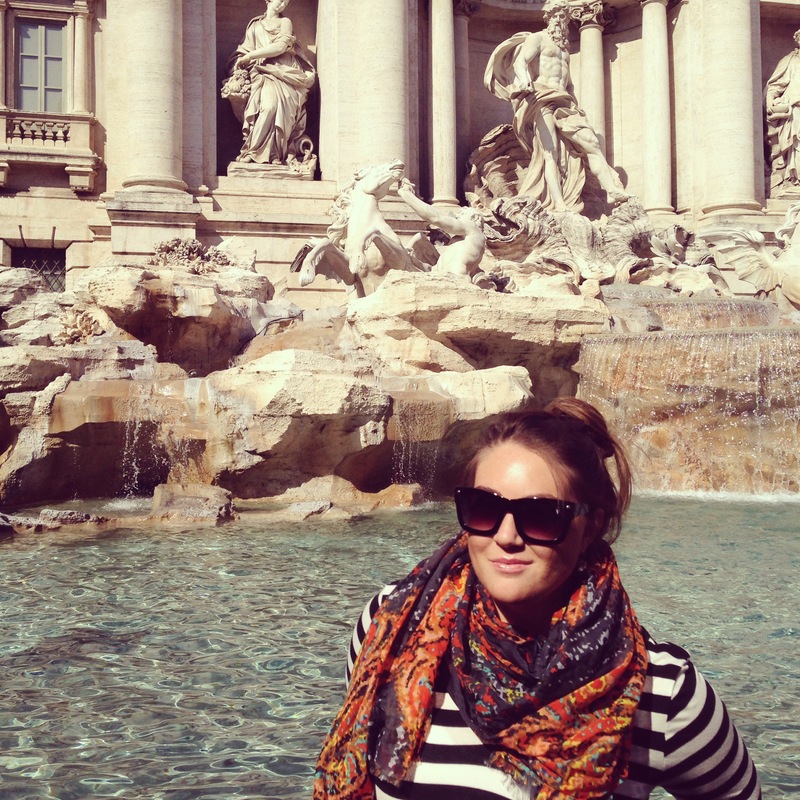 The Fountaine Di Trevi (gave you the Italian name there) was maybe my favourite thing. We thought long and hard about this part of our adventure, and predetermined our wishes- of which we each got 12. We realised that tradition dictates that one should make no more than 3 wishes, but we’re the #UnholyTrinity damn it, we’ll wish as often as we please! My wishes included the usual: true love, perfect skin and world peace. I wish I had had my encounter with the pillock who thinks I have wrinkles before this, because then my wishes could have been a little more destructive. I feel I should also mention that the three of us were the only ones who were making wishes. Is this not a thing any more? 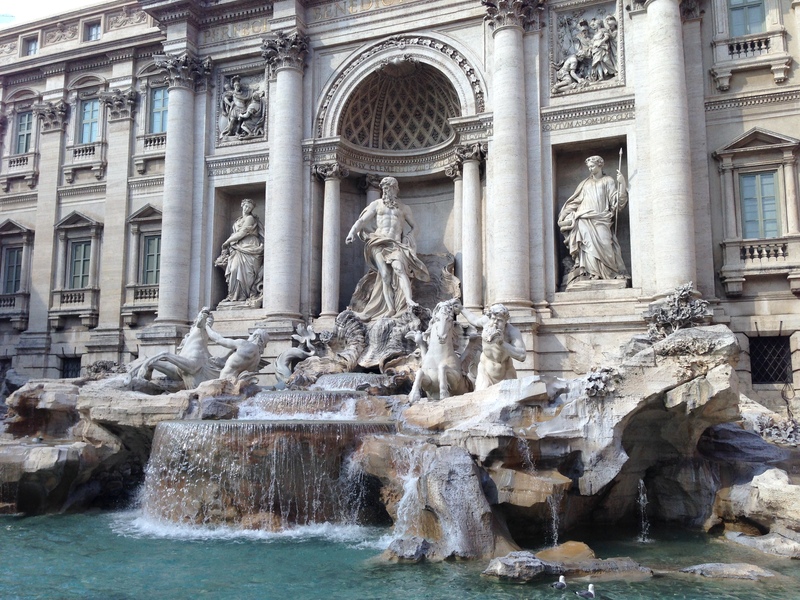 Classic Trevi shot. Whatever, it’s my birthday. Here’s a picture of tomfoolery with my girl Rachel. What an excellent travel buddy. Both of them actually. I think it worked because we were all so laid back and completely fine with just wandering around. 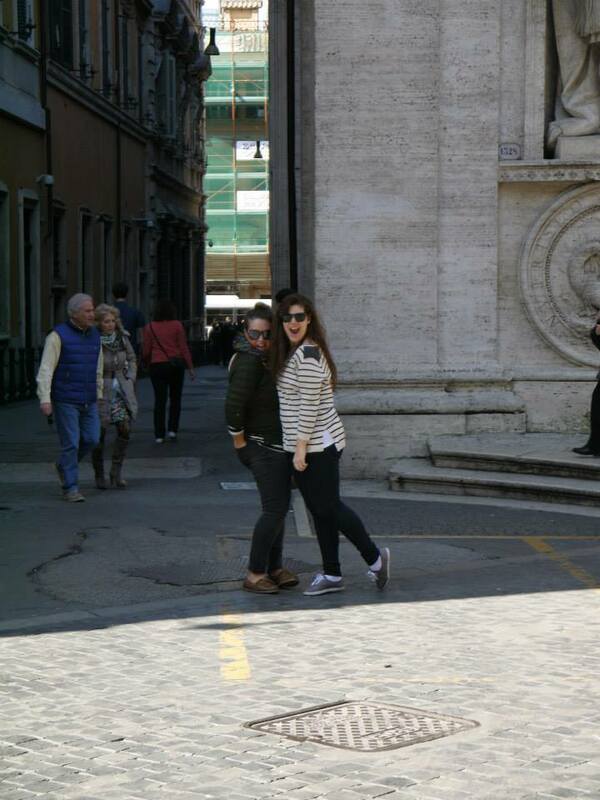 Rachel had done the whole Italy thing before with her family and a very well-educated tour guide. Thanks to her sound memory, we benefited from her knowledge on Catholic and Roman history and stuff. Thanks to my sound memory, you also can benefit from my Rocky Balboa/ whathisname anecdotes. So. Win-win. 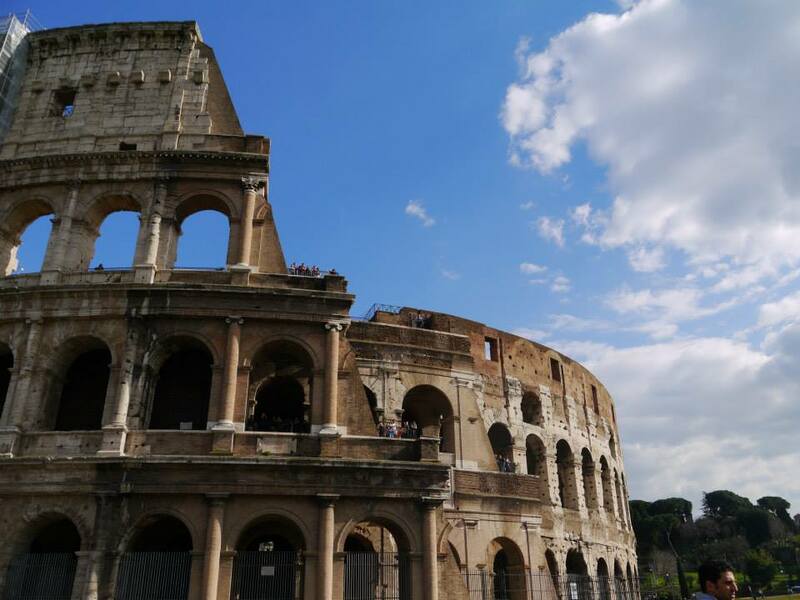 Here’s a picture I stole from Colleen of the Colosseum. The Colosseum, by the way, was the biggest let-down. Half of it was covered in scaffolding, and the proportions of it were not what I imagined. Still, it was cool to be a part of the atmosphere there- everyone staring, open mouthed. I’m sure I’m in the backgrounds of thousands of photographs from that day doing the same. We were hustled into the place by a very fat, very Italian beast of a man with a fedora and a wide gangster tie. I feel like I should stress the word “Gangster” because there is no doubt in my mind that this was a mafia restaurant. When I sat down he told me that “that seat is no good for you, sit here.” STRIKE ONE. Don’t tell me where or how to sit. Then, rather than asking what we would like to drink, he gave us 2 options: flat or sparkling water? I won’t count this as a “strike” but for the record, just ask me what I’d like to drink. Then, out of nowhere , a basket of bread is slammed down on the table without a word to us. Then I watch as the guy chalks up our bill so far: water and bread x 3 people. STRIKE TWO: Hollie doesn’t want to pay for bread she didn’t ask for! I tell myself to breathe and just let it go. I label it “cultural differences”. Then we order our food. I begin to ask for vinegar and oil for the bread I’m now apparently buying, and the sonovagun cuts me off and starts talking to another customer and leaves. What? STRIKE THREE. The fury is building up. Rachel and Colleen’s appetiser arrives, and by “arrives” I mean the guy pushes past me, sliding the plate of food past my face, allowing my nose to graze the food. STRIKE FOUR. I am so livid, but I’m in the strangest place. Anywhere else in the world I would have yelled or left by now. But I’m in a MAFIA RESTAURANT. Meanwhile Rachel and Colleen are panicking because they’ve never met angry-Hollie, who is surfacing, red-faced and stone cold. STRIKE FIVE happened when a waited guy walked past our table, and seeing how un-animated and still I was, got in my face, gesturing and making the rudest “urghhh” sound. With that, I slammed my napkin on the table and let out a very bad word (oh the shame, I’m just the worst) and told the other girls to get me out of there. But the problem remained: mafia. Rachel, the perfect sneak, got their attention and said “excuse me, an emergency has come up, we really must leave- can we get our food to go please” to which the war-lord said, “I don’t have plastic for you and your food is cooking. You’ll stay.” We’ll stay. And we ate half cold food (clearly a microwave was involved). It as just the worst, and because I was so furious there was an atmosphere that my poor friends didn’t know what to do with. We returned to our hotel where we picked things up and actually had the most fun, chatting about our first kisses (Paul Fraser, thanks for the memories) and playing MASH like the 16 yr olds we wished we were. Rachel will be furious with me if I don’t mention the complimentary Nutella muffins that the Panama Hotel supplied. They truly were delicious. 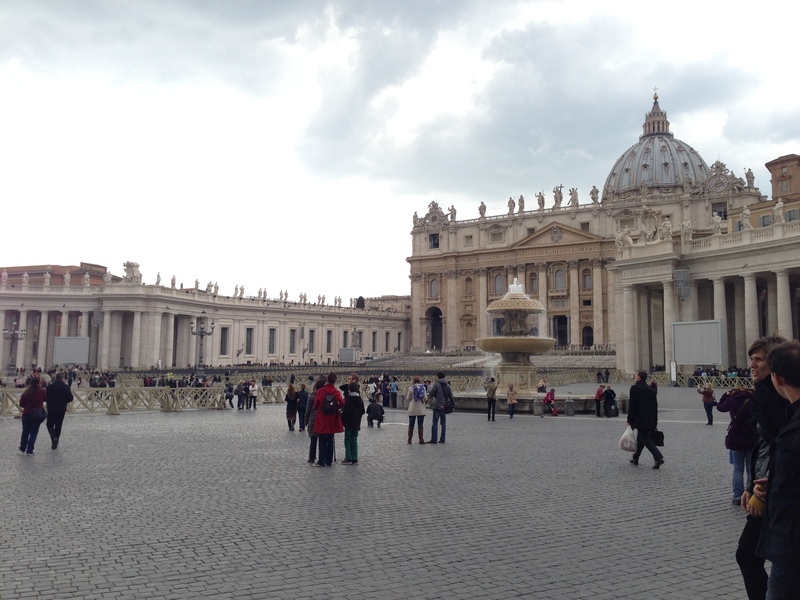 Vatican City- which really is its own country for all intents and purposes- was magnificent. Undeniably. I just don’t know that I get it. 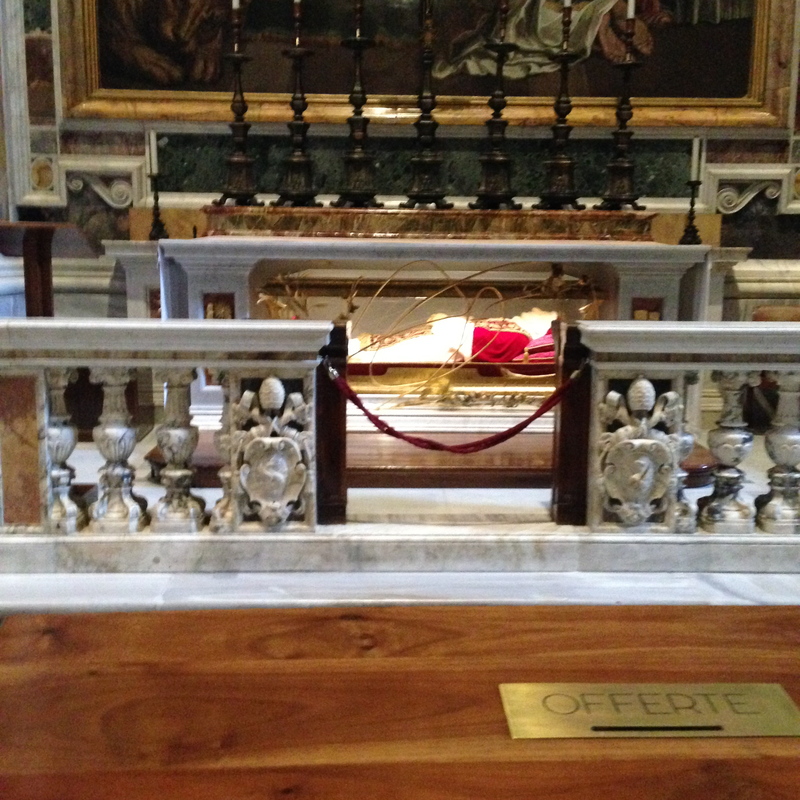 I didn’t like that the main impression I got was that the Popes were more celebrated than the Saviour. 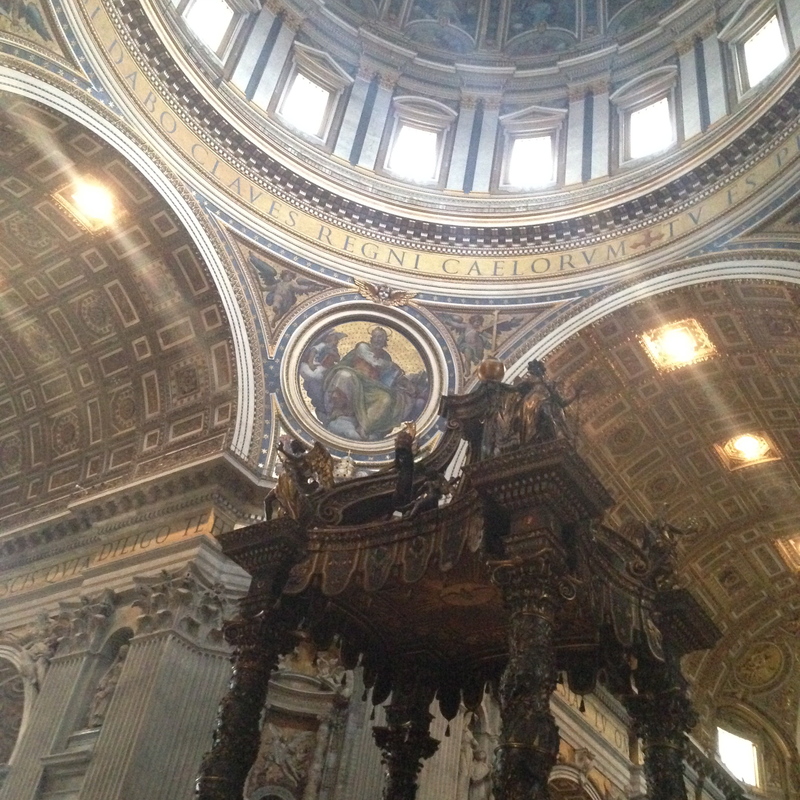 I think that St. Peter’s Basilica was incredibly impressive- ridiculously so, actually. 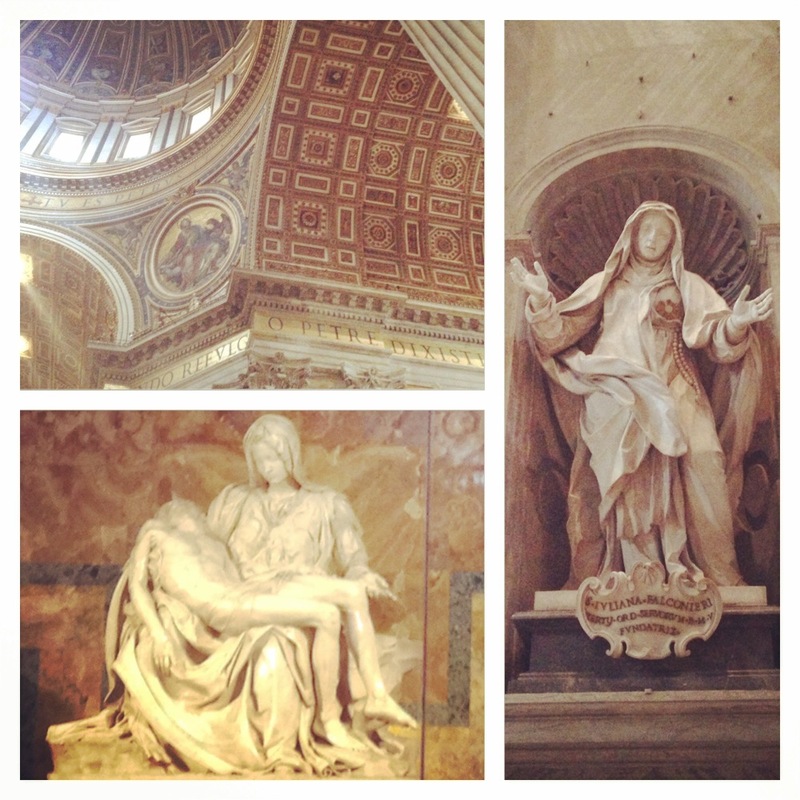 I think the architecture and sculptures were so beautiful, I love the ceilings and gold paintings. 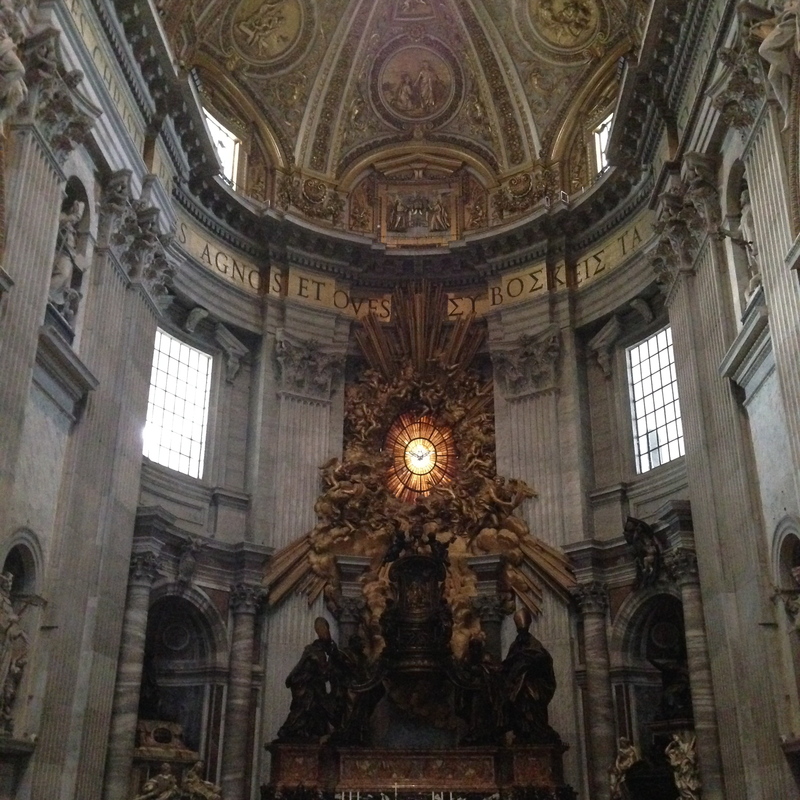 There was an immense carved altar in the very centre of the building, and at the head of the Basilica was a carved throne- for the Pope, not Jesus. But still, I do think it’s really overwhelming to see so much detail so beautifully made. Just imagine how much time and excruciating effort it took to make all of this in honor and worship of God. I like that. 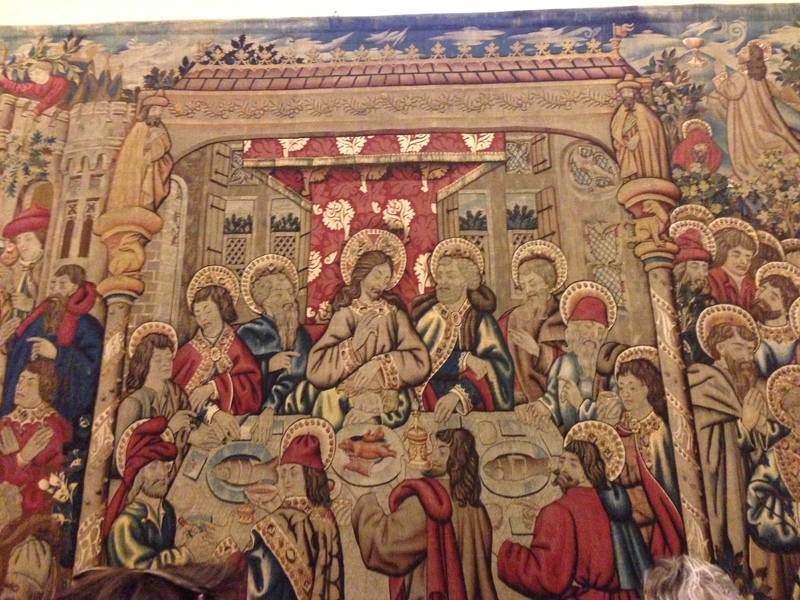 This tapestry was stunning. 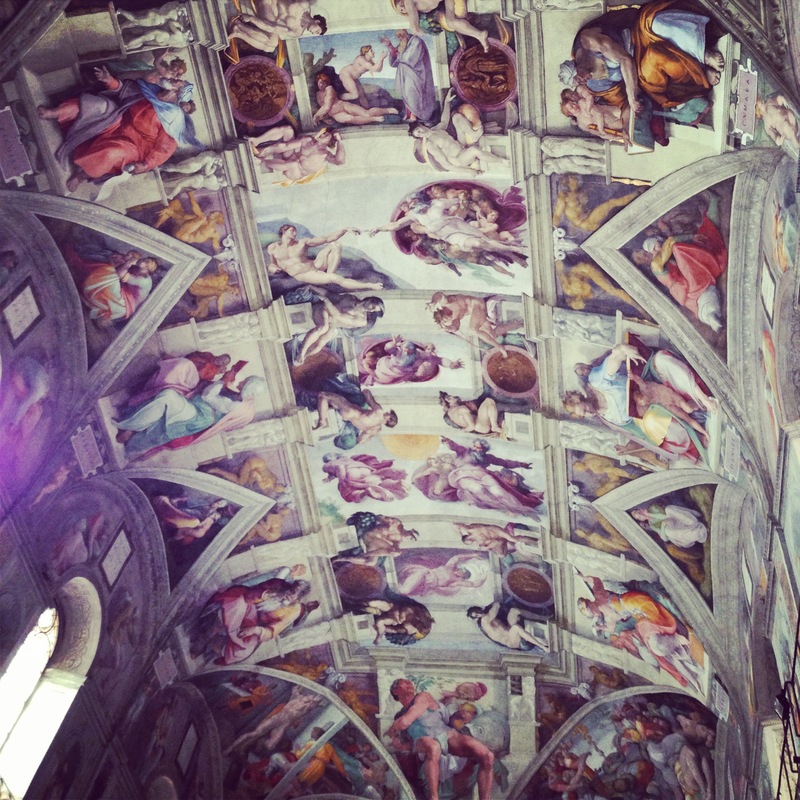 It was all on the way to the most anticipating moment of the trip (for me at least): the Sistine Chapel. 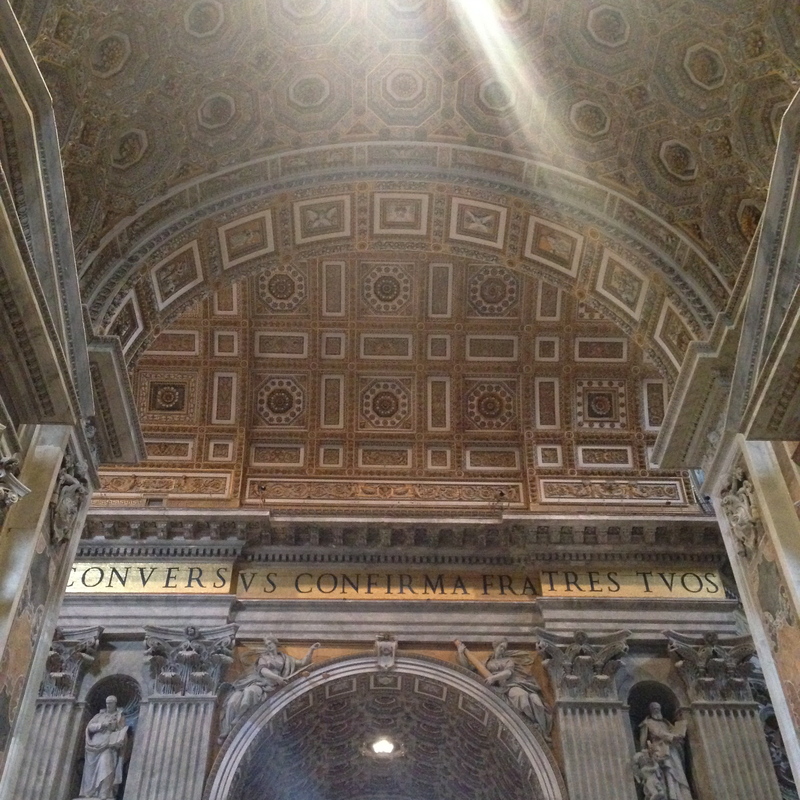 Alright so technically you’re not supposed to take photographs in the Sistine Chapel, but I’m living on the edge! Obviously! There were so many people packed into this small space, but we managed to find a seat and sit for a few minutes in awe. 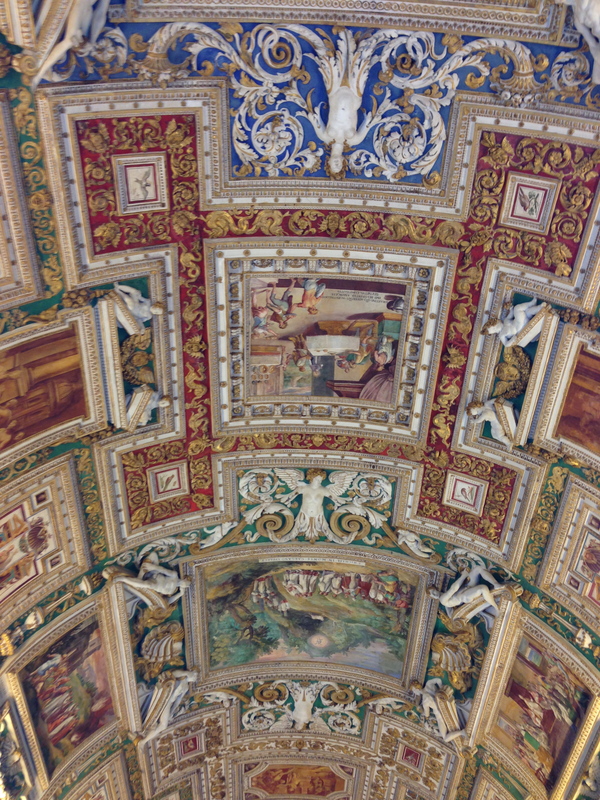 Every molecule of the ceiling and walls are painted intricately by Michelangelo himself. It’s hard to not feel as though you’re in a temple of art when you’re standing in this room. 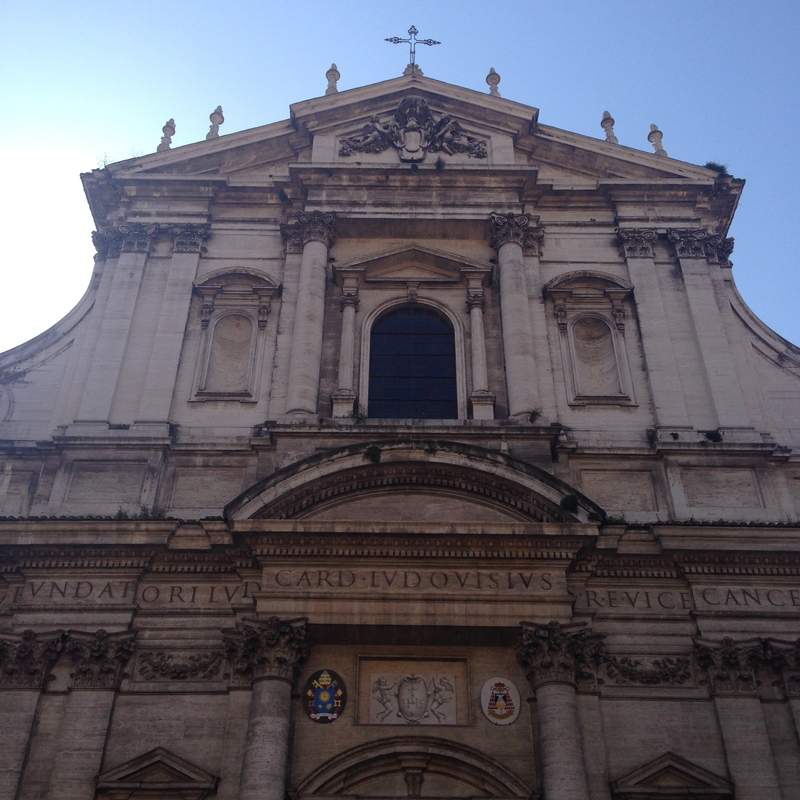 Alright one more embarrassing tid-bit for you: outside the Basilica I lied to 3 priests and Rachel tried to chat them up. So. very unholy of us.